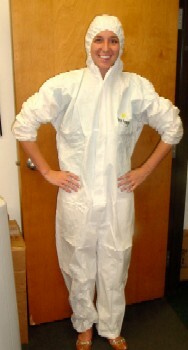 PRODUCT: PREMIUM 3-LAYER BREATHEABLE MICROPOROUS POLYPROPYLENE DISPOSABLE PROTECTIVE COVERALL SUITS. HOODED WITH ZIPPER FRONT AND ELASTIC WRISTS/LEG. MADE BY FROGG-TOGGS. LARGE SIZE. MADE BY FROGG-TOGGS. LARGE SIZE. PRICE/EACH (1). SIMILAR TO TYVEK - PROVIDES LIGHT TO MODERATE CHEMICAL PROTECTION. Ideal for food manufacturing, light industrial, cleanroom, and similar industries where a low particulate barrier garment is necessary. By lightly coating polypropylene with a layer of polyethylene, the material has a reduced particle release and protects from water based liquids and certain chemicals. PE Coated Polypropylene is an economical choice for worker comfort and safety. Applications: Paint spraying, pesticides handling, asbestos, abatement, clean room, fiberglass handling, food processing, general maintenance, light chemicals, mining operations, nuclear industries, dental, surgical scrub, veterinary. Integral hood and boots with elastic wrist and face openings. N95 Particulate Respirator, Gerson Foldable Smart Mask 2130W. Each Mask Individually Sanitary Bagged/Sealed. 20 Masks/Box. Price/Box.